Our high end pair of opal birthstone earrings are enchanting with the 14 carat yellow gold setting and polished finish. Perfect for a birthday gift with the birthstone opal gem. The pair of earrings have a screw back for ease of wear. Measures 6mm in length and 6mm in width. 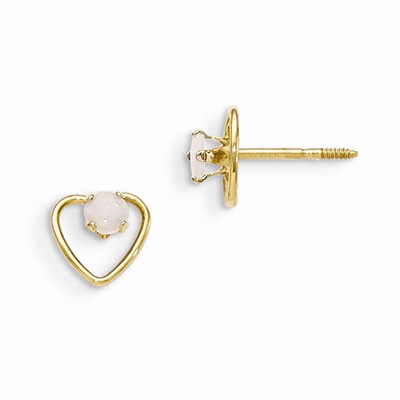 We guarantee our 3mm Opal Birthstone Heart Earrings, 14K Gold to be high quality, authentic jewelry, as described above.